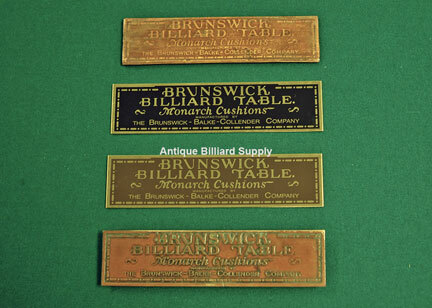 #11-01 Rectangular replacement nameplates for antique pool tables. Correct style as used on pool tables from various manufacturers from the 1890s to the 1930s. Solid brass with background colors of black or brown as shown. About 7.3" wide, 1.8" tall. $50 each.